Maths is a tough subject. To derive proof of a theorem, one has to use formula that can't be manipulated. It's very difficult to manufacture proofs in mathematics. For the examiner, there's no need to look at the result derived. Just a look at the a few steps taken to arrive at the answer and you can catch the mischief. Compare this with social science. Our Social Science curriculum is designed in such a way that we've to write paragraphs of answers. For students who don't study much, just knowing a few revelvant words to throw here and there in paragraph is sufficient to score marks. After all, examiners don't have the time to look at the whole paragraph and assess the content. So mischief makers can easily dupe the examiner. It's easy to catch mischief in Maths, but extremely difficult in Social Science because of abundance of information. Smart students who knew this trick thus could score pretty decent marks in Social Science while they wouldn't succeed in mathematics with same set of tricks. 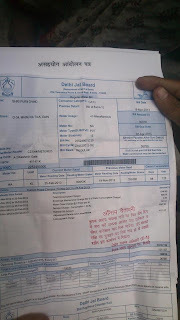 If you read the Facebook post for which I shared in the link above, you will know that this person got a bill of Rs. 93,000. Poor chap. Delhi govt and electricity are indeed sucking is blood. Or are they? Now assume you are a exam paper evaluation expert and find out what information is missing in the answer that you would otherwise be looking for. If you are done checking, find the answer here. Is it common sense that those who don't pay their bills for 1 complete year will get such 'inflated' bills? Or does AAP think that Discoms should wave off the bills of people who don't pay up on time? So who is AAP really fighting for? Those who pay the bill regularly or those who don't? Reconnecting electricity is pretty easy. Any electrician can do it. However, these poor people whose power Mayank Gandhi promises to reconnect will be served court summons. There comes the difficult part. Illegal reconnection of electricity connection is a crime. Will AAP provide legal & financial assistance to all the poor people served notice by the court? AAP hasn't promised this, so Aam Aadmi once caught in legal trap are on their own. If AAP comes to power, they have promised to waive off these arrears. What arrears will they waive off? Entire unpaid amounts or only the excess amount paid compared to old tariff? If entire amounts are waived off, those who paid the bills on time will be fooled and if only excess amount is waived off, those who paraded their unpaid bills for AAP will be fooled. According to AAP, BJP - the principal opposition party NEVER raised any question in the Delhi assembly in the last 3 years on water/power tariff. Check it out yourself from AAP's Facebook post. They have also made this claim in several of their statements. Dr. Jagdish Mukhi's is a BJP MLA whose details can be found here. AAP's calendar is probably showing the date of April 1st, 2020 all the time, which is probably why dates of above two assembly proceedings don't fall in the "last 3 years" time period. There are also links to news report of various agitations done by the principal opposition party on issue of tariff hike. Find them here, here, here and here. BJP even filed a case against Sheila Dixit govt, and Kejriwal used a BJP forum against DERC hike to launch his electricity agitation in the first place!! AAP thinks people will just shut their brains and consume anything manufactured by them. They use unpaid bills and show them as unjust & inflated, rewarding people who don't pay bills on time. This is incentivizing those who don't pay their bills at all. Added to this, lies act as catalyst for a 'civil disobedience movement' which really isn't civil disobedience movement. It is a communist movement meant to stir emotions, use fear-mongering and spread anarchy in the name of 'justice' - all for votes. AAP doesn't have a govt just yet, so it's not proven corrupt. But it is right on the path to corruption. Let's now convert the solution provided by AAP from Social Science format to a Mathematical formula. Update (08/Apr/2013): AAP has declared that they'll have a group of lawyers fighting cases for free for those served summons by court. Declaration made here. Excellent article with all data and docs. Will AAP pshycofans reply? Good job ... read it fully and understood their politics too .. I told you that I will respond to your "expose of AAP's exposes", and accused you of Promoting Mr. Modi by maligning AAP on NewsLaundry comment section. Let's start with this article. This Civil Disobedience movement is not only about an individual effort, it's about the community as a whole. When a person living in a jhuggi basti gets a bill of Rs. 93,742/- we all know that something is wrong with the current system. Many of us may be able to pay the bills we get but we also need to think about our responsibility towards the community as a whole. Let us join hands and try to correct a part of the system by this small step. 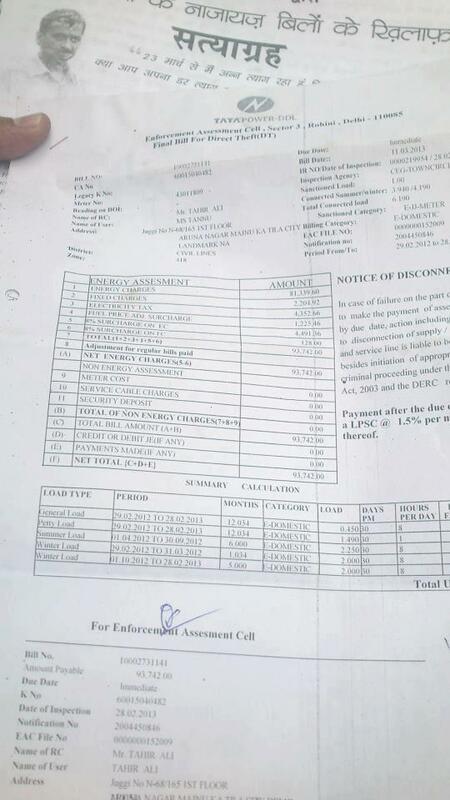 A family earning Rs 6000 per month gets a water bill of Rs 36,000. Nowhere is it said that the bills are one month bills. The purpose here is to show that if people from poor areas who don't even earn this much, if pay these bills, how will they survive. You assumed (best case scenario, worst case, you are deliberately misinterpreting) that these are monthly or bimonthly bills, and thus declared that AAP is lying. Watch AAP's Videos. In some of them, they have said that some of these bills are yearly. Also watch videos, where Arvind Kejriwal explains where is the problem. He there quotes the amounts of the bills to be 3-5000Rs. for electricity and 1500Rs. for water per month (the famous rikshawala example). They are fighting for the collusion of Discoms and Congress, that is making survival of these families getting these high bills, which are more than their incomes (yearly or monthly). And you are defending Congress, because you can malign AAP, to promote Mr. Modi. How fair is that? You include a note that AAP will provide legal aid at the end, not before the paragraph that you wrote to malign AAP. (This is standard practice. Such notes are added before the relevant paragraph or at the start of the article. This shows your malice. You also attempted to falsify AAP's claim that BJP didn't do anything against the Congress-Discom collusion, and show your "proof". Am I to asume that you provided proof of BJP doing anything against the "Congress-Discom collusion"? I see no such thing. There is a vague line that doesn't show anything that intends to expose the collusion. And are you defending BJP, because it wasn't allowed to ask a question, and kept mum ever since on high electricity prices, let alone the collusion? What did BJP do, except asking a secondary question, that wasn't allowed to be asked, perhaps because of match fixing between BJP-Congress? If AAP can make such a huge movement of the issue, get 10,00,000+ signatures and do 300+ sabhas, even for their own political gain, can't BJP do it's 10% to solve people's problems? In the best case, you are writing based on your own presumptions, nevertheless, you are doing a disservice to the nation, by siding with the corrupts. You are deliberately twisting the facts to malign AAP. The problem is collusion and corruption of Congress-Discoms, that is making survival of people difficult. That's the issue AAP is raising. IF the whole issue is wrong, I urge you to expose AAP. In absence of any such proofs, please don't help the corrupts kill the movement. If this convinces you, please remove mathematical rhetoric from the article. It's because of our individual egos that our country is in this state. For once, can't we leave them aside? Let me reply to you point by point. 1. A regular "bill" doesn't include ARREARS - it's common sense. So when AAP said "bill", it was intended to sound as though bill of 93k was served for a one period of billing. Fact is, those two "bills" AAP showed were actually FINAL NOTICE to people asking them to pay up or face disconnection, and it included all arrears they needed to pay. AAP thought it could use these to show how poor people got such huge bills. AAP conveniently hid the fact that those people had ARREARS. All I did is expose what AAP hid. 2. I have no intention to defend anyone when they are wrong. Be it BJP, Congress or AAP. But I will call the bluff on lies being spread. 3. The update I got on AAP's declaration was after I published the blog. I have included the clarification at the bottom at least - that too without anyone pointing it out to me. I found this fact MYSELF. I could have conveniently ignored the fact and not included it in my blog at all like AAP does. Has AAP admitted it's mistake on Modi exposé? It's been a month since their lies have been exposed on AAP's claims on Modi. Kejriwal and associates have been tweeted about this blog several times by several people. I'm sure they have already read it, but did they come out with even one line clarification and remove what was found to be incorrect? NO. Who's indulging in malice? AAP or me? 4. This blog was not meant to defend BJP but call AAP's bluff. AAP claimed that BJP asked NO questions in last 3 years. I have debunked that lie with proof. Don't divert the topic saying that BJP didn't do this and didn't do that. You should seek answers from AAP as to why they lied about BJP not asking questions in assembly if it was not for malicious intent. 5. Calling AAP's bluff is not doing disservice to the nation. You talk like a communist far-left ideologue. "My way or no way" has been communist mantra. Also "Anyone opposed to AAP is on the side of corrupt"
And "AAP is the only way to salvation"
I have seen this argument a lot. Don't expect me to buy it coz I'm not brain-dead. 6. This is my blog which I maintain for my interest. I am free to express my opinion much like anyone else. So the last paragraph you see is my opinion based on the facts exhibited in the blog. I have no intention to remove it or stop expressing my opinion based on facts revealed. What you do on your blog is of course your concern and prerogative. Pardon me for requesting you to remove your rhetoric. You have not responded to any of the questions. I still maintain that you are maligning AAP, just to help Mr. Modi. You claim to expose something, but there is no substance, just pure speculations and biases on your part. Let me respond to you point by point as well. 1. You invoke common sense in your first rebuttal. So if so anything that's not common sense is wrong? You question, people will assume something and thus AAP is lieing. That's plain gibberish. People, just like you, are free to assume anything, but AAP didn't lie. 2. You say you have no intention to defend congress or BJP, but that's what you are doing nonetheless. That to by deliberately misrepresenting the facts and adding your presumptions to it. 3. I have responded to your "expose of AAP's Modi expose", and although you are not convinced, because things don't add up according to you, it's corruption nonetheless. You don't want to see it is a different matter, and AAP isn't responsible if you love Mr. Modi too much (I am saying this in all honesty). The malice is there in your writings, intentional or otherwise. Just like you preach about common sense, so is your malice apparent. It's common sense. Just like, it's common sense to include updates and new information where it's relevant or even before article starts. This shows your malice. 4. The fact is, BJP didn't ask the question. They were not allowed to, as per your own admission. Your bluff has been called. 5. You are not calling AAP's bluffs. You are finding irrelevant faults. You are answering my questions selectively, and ignoring the inconvenient ones deliberately. Like the very pertinent question, what does your expose prove? You are implying things because it's common sense according to you, and thus proving AAP liar. That's not only motivated, but malicious. 6. Expressing opinions is not wrong. You are deliberately misrepresenting your opinions and presumptions as facts. Please carry on, and people will call your bluffs. I see frustration speaking here and not facts. As with any AAP supporter, AAP's lies are 'irrelevant faults'. You may continue believing what AAP says, and you're welcome to point out bluff in my future blogs as well. It is a privilege AAP doesn't accord anyone with their allegations. You are absolutely right. I am frustrated to see that well educated and well meaning people like you (and Madhu on NL, from where we kicked off) are opposing AAP for no worthwhile reason. It is frustrating beyond imagination, because I am getting convinced that you may not be paid supporters of Mr. Modi, in which case, it's even horrifying that the super corrupt Mr. Modi is backed by the likes of you. I have called your bluffs on your this very blog, and it's your choice to accept or reject them. Forget everything I said before. Just tell me, what does your exposes of AAP's exposes prove? I'm not opposed to AAP for some crappy reason. I have my own reason which you don't find convincing enough. I've seen far-left politics in my life, and I dread it. AAP is going down the same road and I can see it - you can't. You AAP supporters have this problem of not being able to respect others' point of view. I've been called 'Deshdrohi' for opposing AAP. Many senior people have been called that by AAP supporters. And this characteristic of AAP and its supporters makes AAP a far-left organisation that propagates the thought "My way or no way". My exposé on AAP's Modi exposé proves that AAP is more interested in political vendetta through lies than serving "Aam Aadmi". It proves that they will stoop to any levels to achieve their political goals. If AAP was really neither-right nor-left, they would have been more like Lok Satta Party. That party doesn't believe in maligning others, but only in proving itself through own hard work. I respect your experiences. I have no problem if you are against AAP, if you have good reasons for that. Hell, I will join "Jai Ho Modi" chorus (I used to do that, before I became activist, some 10 years back :) ). I can see far-left, if you show me. Do I not have understanding of economy sufficient to understand it? Try me. If you think it's so subtle that I can't see, then I think you may be mistaken. I don't have any problem respecting opinions of others. Read my responses to super abusive Modi Bhakts on First Post. I have been called much much worse. If you want to elucidate who is more abusive, I can prove that Modi supporters are multi-fold times more abusive and more in number than AAP supporters. Just go to First Post and read ANY comment section. We can debate on this, but this is irrelevant. Please, don't engage in rhetoric that "AAP supporters are abusive, so AAP is far-left". It's more true about Modi supporters than anyone else. But all Modi supporters are not alike, and so is true for all AAP supporters. You are not talking any substance here, Gunny. You mention "Political Vendetta". Which one? Where is the Vendetta, political or otherwise? You say you proved that AAP is maligning others and will do anything to achieve their political goals. So first clarify what is their political goal. Next, Please clarify, when did AAP maligned anyone? Which law levels did they go? Your article doesn't clarify this, though you think so. Let's come to specifics, if you like. You say AAP should follow Lok Satta Party. Buddy, many of the things they are trying is based on their model, like candidate selection process. But your logic that if they were neither left nor right then they should imitate Lok Satta Party is pointless. Maligning and Exposing are two different things. IF you are maligning AAP, AAP is maligning others. IF you are exposing AAP, AAP is exposing others. You both are doing the same thing. I am with AAP, because your arguments and proofs (only according to me) are very very weak, and when I talk about it, you counter with perceptions and opinions. I am not happy about it, but will discuss it nonetheless. I have no time to debate with you. I have better things to do. Gunny, this is not fair. You claim to expose AAP, and when asked questions about it, you don't want to offer clarifications. Your this blog is affecting many many hard working AAP volunteers, who find time to do something for the nation. What better things you want to do, when it's the future of nation at stake? I don't claim to have you exposed here, but it's not fair on your part. I don't have time to debate my friend. I have to read and understand more than debate your new allegations against Modi. Allegations will keep coming against him and almost all will be baseless as we have seen from our experience. If this blog is affecting AAP followers' morale, you can help AAP by telling them to improve quality of their 'exposé' if they plan to continue doing the same - or stop it altogether. Not true. The comment you responded with "I have no time to debate with you. I have better things to do." doesn't have any allegations against Mr. Modi. I am asking you to prove what you say. I'm questioning your expose. You should back at least what you claim. I seek to prove one way or other what you claim. Modi supporters are using your site to abuse AAP supporters. Your claims must then be probed. That's what I'm doing here. What's the problem? If you don't have time to defend your own hypothesis, you must declare so and stop this comment section. That way, people will come to know this is one way communication. I of course understand that you indeed don't have time, and nor have I or all the AAP volunteers. But we (you, me, everyone) are not here to play games. We are trying to shape the nation the way we want, and in democracy, discussion is the way. We must proceed with the discussions, and you must respond to what you claim. Is it not fair? AAP claimed that in last 3 years BJP asked no questions in assembly, didn't question Delhi govt on tariff hike. Gunny, you claim to prove something. I don't. So you have to prove it, not me, or consider your claim void. Are you from Delhi? If yes then you would very easily be convinced by the allegations on Congress in Delhi put forth by AAP. My dad is very well off, but over the years I have gradually noticed his discomfort with increasing electricity bills. As opposed to a time in our lives when we would turn on the AC without any hesitation, we now have a working cooler and the AC is barely ever switched on. And the cooler is not as effective or convenient. It is the electricity bill that reaches the sky which is forcing us to do that. This was only one of the examples from a very well off family. You can imagine the state of the "Aam Aadmi". My mom wakes up every morning at 6 am to turn on the water which comes for half an hour. And then again around 6 pm. Yamuna river is declared dead. S.D. spent about 18,000 crores on it. Where did the money go? It has been very well known that Delhi as a state does not lack water, but Delhi as an abode does. Why? What has AAP done wrong by raising these issue. It is their right and prerogative to contest with any agenda. As long as you are not able to prove the whole or significant part of the agenda as false, how can you declare the party to be lying or cheating? I agree with mitesh who very well tried to explain to you the shortcomings of your article. And judging by your writing skills, a man of your intelligence will surely understand, if not now then later. Thanks. Jasmeet, this blog doesn't defend high power tariffs. It only aims to expose AAP's methodology of selectively hiding information and using lies against their political opponents. So when you say power and water tariffs have gone up, I would agree with you. But what's the solution to this problem? Is it to equate Congress & BJP and using lies against BJP as AAP has used? AAP is only weakening the fight against corruption by working against the opposition to Delhi govt. AAP govt is very unlikely to form in Delhi. Even if it does, I am 100% sure that half of their promises cannot be implemented, and remaining half if implemented will plunge Delhi into darkness. AAP's idea of giving 700L of free water to every household in Delhi will backfire. Nothing is free - AAP is acting like a communist party (it actually is one) - where people have to be served by the state. That idea doesn't work in the long term. If there's a solution, it's to work with the opposition and throw Congress govt out. But AAP will only facilitate another Congress win in Delhi in 2013 assembly elections. You Delhiites have long winters ahead, thanks to AAP. 1. First of all, the 93000/yr = 7750/month. For a poor people who is earning 10000/month, this amount is still very high. Even though you started this blog with math, you are yourself missing at such simple math. 2. When Kejriwal said that opposition BJP did not protest against power tariff hike, I think what he meant is that they didn't put any strong opposition. In this video (http://www.youtube.com/watch?v=jFeltrMlf4s), Kejriwal said that BJP had hidden some papers and Mr. Goel did not reply to that even face to face on their own stage. 3. All the links that you have given which show that BJP had protested against power hike belong to ONLY ONE opposition that they had made in mid-2012. Why they did it just a year before elections? All Kejriwal said that they had papers much before that time and they did not put it in fron of public. This clearly shows the collusion of BJP and Congress. 4. In water bill, you have hidden the fact that the bill is from 19-Nov-2012 to 25-Feb-2013, which is 3 months and 7 days. And that comes to 12000/month of water bill. Another math mistake on your side. 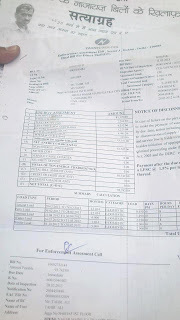 And again this bill is also very high for a common man. 5. Regarding re-connecting electric wires, Kejriwal had said that it is him and AAP people who will re-connect the disconnected connections and that they are ready to go to jail for that. And yes, Kejriwal also said that if AAP comes to power in Delhi, all the cases related to this will be taken back. Awaiting for comments on these clarifications. PS: A note to mitesh9, please be gentle and provide proofs for your arguments. Don't act like these BJP and Congress paid goons. 1. 7750/month is equivalent to consuming 1310 units in a month as per the Delhi Tariff. I've done my math. Which Aam Aadmi will consume so much power in a jhuggi jhopdi? Even with 2 ACs, a rich household consumes about 600 units/month. If this is a meter issue, then Kejriwal shouldn't use this bill for his propaganda. 2. AAP's facebook page, link to which I've provided said categorically that *BJP did not ask any questions* on Tariff hikes. This blog is written in response to that claim. 3. BJP always protested tariff hike in 2010 in this link: http://www.tribuneindia.com/2010/20100615/delhi.htm#1 Which is mentioned in the blog above. 4. I've also not highlighted the fact that in 3 months, the person consumed 123 KL of water. 1 person needs 150L in a day for all chores. 5 ppl need 750L in a day. In 98 days, they need 73.5KL. This person consumed 123 KL in 98 days. That means either there are 8 ppl in the house or meter is faulty. In either case, AAP shouldn't use this bill for their political propaganda. 5. You're right on this. I've published a clarification towards the end once I read it on AAP FB page. I'm not disputing the fact that Delhi power/water tariffs are high. I know they are. But AAP is using bills of people who consume large amount of resources or bills in which meter is faulty. This is not a bill common man gets. AAP would rather use stories from Jasmeet Singh (above) who has a *genuine* concern on high tariff, than of people who don't pay for 1 whole year. Also what if AAP doesn't come to power? What'll happen to people who've defaulted? They'll be left in limbo. I acknowledge your point 2 and 3. However, as I said Kejriwal might be saying that BJP is not putting a strong opposition even if they had all the papers, as also mentioned in the video I said in my point 2. Regarding point no. 1 and 4, Kejriwal has also accused that some meters are faulty. This has happened since the privatization of electricity and water was made. The reason that Kejriwal is saying this is because even private companies are colluding with government and that Sheila Dixit favors these companies. And thus it becomes an agenda of corruption and hence it is necessary to bring it to the people. And people who are joining hands with AAP believe that AAP is doing things for good. No one is forced to join AAP. So I think people are ready to take it on themselves even if AAP does not come to power. Also, as I said in point 5, the re-connection cases are taken by AAP activists and not the people, so it is AAP activists against whom cases will be filed for re-connection. Watch the original press conference, at 03:45 and 25:21, Kejriwal is saying that the order of Barjinder Singh was kept secret by both BJP and Congress. Also, the electricity rate of 7750/month and water bill of 12000/month of water bill are pretty high for a common man (as opposed to what you tried to show). As to why these bills are needed to tell the people even if they are due to faulty meters, I have explained above. This gives answer to all your claims in your blog. "He said the DERC had given directions to the three private power distribution companies of Delhi to reduce power tariff, but the city government is obstructing the reduction on technical grounds. The commission should use its powers and if needed, go to the SC, he suggested." If common man consumes 1310 KWh units of power a month, he's no more a common man. 8-10 people living in a house should expect hefty bills for water - but this bill was too hefty even for 8-10 people. Point is, Kejriwal can use *actual* bills where people have been asked to pay more. Using defaulters' bills and bills from faulty meters only helps fool people. Also, their claim on FB page about BJP not asking *any question* in assembly has been proved to be total BS. AAP can stop using false propaganda or face their own mirror of exposé. It's their choice. My earlier comment was already discussed here.. did not read the reply section completely before typing my comment.. I used to live in Hosur 2 years ago and our electricity bill for two people was 250 Rs a month.. I have to point out here that we never had gas to cook and we used to cook on induction stoves.. And many a times our geyser would be on the whole day. Now that I am in Germany I have to tell you that a 4 person house here pays about 100 Euros and by last years exchange rates its about 7000 a month.. Now to the point that AAP's methodology is wrong in using he power prices and not faulty meters, i have to remind you that AAP had discussed in detail about the bills and the reason for them the faulty meter and the way in some places meters are connected in series and not parallel. It is absolutely clear that you are a BJP guy.. In one of your comments you say AAP is a communist party.. Where is the proof.. Aren't you now doing the same thing you are accusing AAP of..
AAP has always said that BJP MLA's should have resigned when the power tarrifs were hiked and this is the kind of protest what they should have done..
'But it is right on the path to corruption.' If you run a blog that you claim is only to bring out the truth to people, then please making Judgmental statements and only provide the said statements and your so called clarification for them. You are no better than any other media house we have in India today. 1. Electricity meters are ALWAYS connected in SERIES and **never in parallel**. If you know the basics of physics, you would know why. If revolutionary engineers in AAP told everyone they're supposed to be connected in parallel, then they again fooled gullible people. a. Running a faulty meter. b. Power hogs in jhuggis who run businesses out of thatched sheds. 3. AAP hasn't used used bills from actual customers in their propaganda. 4. Power tariffs in Delhi are quite high. However, they're not the highest in India. Power tariffs in Kerala are quite comparable to those in Delhi, with added power cuts that Delhi doesn't have. 6. I'm an independent blogger, who leans right. Supporing BJP at the moment. 7. No matter what protests BJP did, or would have done, AAP would always have said "BJP didn't do enough". Even if BJP MLAs did self-immolation, AAP would still say "Congress-BJP Bhai Bhai" because AAP's purpose of establishment itself is to equate BJP and Congress. Only a blind bigoted fool will think that BJP and Congress work in unison. a. It already has given ticket to Deshraj Raghav from Uttam Nagar, who was a Congressi for 30 years and has Lokayukta inquiry in illegal ration shops in his and his family's names. b. Corruption is not only monetary corruption. They're intellectually corrupt. Their formation of a special committee for "Muslim Issues" while preaching to other parties to keep religion out of politics, and calling Batla House encounter "fake", blaming Narendra Modi & Amit Shah for Muzzafarpur riots in UP, while riots started in UP in March 2013 - all of these show that AAP is here to implement Islamist and Communist ideas in the guise of fighting corruption. I am not a media house. This is my personal blog, and I have all the right to make judgments. No media house is unbiased. Every blog linked to AAP also is blatantly biased. For example, they would never publish the rubbishing of their expose of Modi in this blog of mine. However, baseless judgmental statements are made by Kejriwal when he says "Vijay Goel is corrupt", but says in next sentence that he has "no proof" for his judgment. It's time Kejriwal stopped his shoot and scoot, or be ready to face the same, now that he's a "neta". I like your analysis and you may be right. I think you are taking AAP words too literally .Please look at the big picture message . You have to understand that vast majority of the country is not as analytical and logical as you may be. Its important to simplify matters for people to understand. If eveyr fact is presented without emotion then AAP will never win. Statement A is AAP says : ":BJP has never questioned Congress about power bill "
Statement B is AAP says : ":BJP has mostly not questioned Congress about power bill"
Now I know you will prefer Statement B because its "factually" correct but if I were AAP leader I would prefer Statement A since it simplifies the message for common man who is illiterate. IQ and EQ of the common man in India unfortunately is not at a level where they can be provided exact facts.